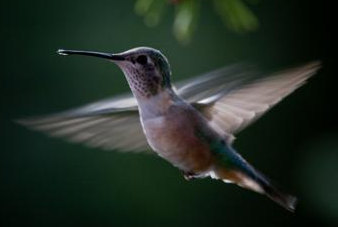 Q: Why do scientists think humming birds hum? A: Because they can’t remember the words! Explanation: “To hum” can be to sing, “la, la, la” when you don’t know the words to a song or keep your lips together and make the notes of a song. This joke is funny because hummingbirds don’t really hum; they chirp. They’re birds! I wonder why they can’t remember the words? Here is a scene where Ingrid Bergman hums a few bars. This entry was posted in Education, ELL, ESL, humor, Joke, jokes, jokes explained, kids jokes, reading, writing and tagged ELL, ESL, hummingbirds, humor, joke, jokes, kids, kids jokes, reading, writing. Bookmark the permalink.